Previously on The Great British Bakeoff: Toby crashed and burned fairly spectacularly, Ruby nearly had a breakdown, crème curdled, we remembered that salt is not, in fact, sugar, and Rob was the standout. Bread day! This makes me happy because I am a very regular, longtime bread baker myself, so I feel like I’m actually on pretty familiar ground. Bread is Paul Hollywood’s strongest suit as well, and he tends to be pretty hard on the bakers on bread day. And it’s only the second week. Ooof. Paul thinks that bread is the hardest thing to master, which isn’t true at all. Bread is very forgiving, certainly more so than most other pastries. You just have to have the basics down. The bakers arrive while Sue and Mel think of bread-related puns that aren’t even really funny enough to transcribe. The bakers are welcomed to the tent and told to make breadsticks for their signature bake. Sue says they want something crisp, which will snap like one of Paul’s hair shards. Hee! Everyone gets to work while the VO tells us breadsticks got their start in Italy, where they were known as grissini. Glenn’s using butter in his breadsticks, which is a bit unusual. Rob talks about how important it is to get rid of all the moisture, so it’s nice and crisp. We learn that he likes foraging for mushrooms in his spare time. Howard’s chopping preserved lemons for his Moroccan-style breadsticks. In his spare time, he’s a painter. That makes sense, having seen some of his work. Ali’s new to bread and is doing garlic, parmesan and blue cheese breadsticks. The bakers start kneading away, some using the slapping technique, where you basically just slam the dough against a surface (which is awesome if you have any extra aggression to work out), while others use the typical push-and-fold method. Mel notes that Beca’s wearing almost the exact same top as Mary, which both women think is funny. Dough is put in proofing drawers to rise. Ruby’s making Mexican-inspired breadsticks using two types of dough twisted together. Dough is removed and rolled out. Deborah is using a pasta machine to roll hers out, which is pretty brilliant, actually. Ensures a uniform thickness. Lucy the horticulturalist is making salt breadsticks. Seriously, that’s her flavor: salt. And her dough’s too wet. Paul meanly tells her there’s a way to fix it, but he’s not going to tell her. And it doesn’t matter anyway, because she’s already cut her dough, so nothing can be done. The breadsticks have to be 10”, so some of the bakers start using rulers to roll them out. Others just wing it. Frances is the only one doing a sweet breadstick, with ginger and chili chocolate. Of course, because it’s Frances, it’s got a gimmick, so they’re all going to be made to look like giant matchsticks and put in a huge matchstick box. Sue wonders how she finds time to do all this Martha Stewart stuff, and I do too. I mean, I’m pretty crafty, but I have limits. Bakers obsessively watch their sticks while they bake. Sue announces they have 15 minutes. Glenn’s don’t appear to be baking fast enough. With one minute to go, everyone starts dishing up. Some of them look really great. Most of them, to be honest. Glenn’s are still a bit anaemic, though. The matchsticks are kinda cute. Ali’s Italian-flavoured sticks get high marks. Paul loves the Parmesan, Mary loves the blue cheese. Ali looks relieved. Glenn’s rosemary and Parm sticks get slapped for not being uniform in colour and for being a bit too soft. The flavours are good, though. Deborah has fennel and chili breadsticks, which are nice and crispy. Mary likes the subtlety of the fennel. Kimberley’s nigella and Parm sticks are perfectly crisp and have amazing flavours. Rob has twisty rye breadsticks, which Paul declares very neat and precise. Mel and Mary start playing pick-up sticks with some of his breadsticks, until Paul hustles them away. Heh. Frances’ massive matchsticks get high marks for presentation, though Paul isn’t crazy about the flavours. Ruby’s Mexican sticks have come out fine and look beautiful. Apparently they taste lovely as well. Christine has Mediterranean breadsticks which needed a bit more loving care at some point in the process. Mark’s rosemary and raisin breadsticks snap, but Mary doesn’t care for the raisins. Paul’s a fan, though. Howard’s Moroccan breadsticks (yes please!) are too chewy but Mary thinks the flavours are really interesting. Lucy’s salt sticks are boring and irregular. Beca offers up fennel and chili breadsticks that didn’t stay straight, but they have a good snap and nice fennel flavor without too much heat. Afterwards, Lucy admits she’s both relieved and euphoric, Ali’s happy not to have screwed up. Technical challenge: they need to make 8 identical English muffins. Hmm, that’s a tough one. I’ve tried making English muffins in the past and they were…ok. It might have been the recipe. The Bakewells are using Paul’s recipe, of course. They get started. Glenn says he has no idea what the end result should be like. Seriously? Has he never had an English muffin before? What an odd thing for him to say. In their tea tent, Paul and Mary talk about how wonderful English muffins are and what they should look like if they’re right: good crumb, brown on top and bottom, white on sides. The dough’s seriously wet, which makes it very hard to knead. Ruby actually loves working with it, but Ali seems frustrated. Lucy shows Sue how she can actually see the gluten developing. That’s why I love working with wetter doughs. It’s immensely satisfying to me to suddenly see it coming together properly. Kitchen alchemy: one of my favourite things. The recipe just says to prove the dough, but doesn’t say how long. The bakers do their best. It doesn’t look like Howard’s rose at all, which is odd. This is an enriched dough, meaning it has sugar and butter in it, and while the butter will keep it from puffing up a huge amount, the sugar should feed the yeast, so the dough should do something. They gently roll it out, so it doesn’t lose all its air holes. Mark’s afraid to roll it, so he just kind of pats the dough out. The recipe also doesn’t say how big the muffins should be. 3” or so across, folks. They look at cutters and start to get anxious. Today’s history lesson is about the Muffin Man (who lives on Drury Lane?) and the origins of muffins, which originated with the lower classes, who made them with leftover bits of dough, so nothing went to waste. Eventually the rich people tried them and started to request them and muffins started to get super popular. In industrial cities, Muffin Men walked around, ringing a bell, selling muffins for people to munch as a snack. They tended to become popular local characters. One, John of Cheltenham, stood three feet high and was so popular he was able to sell portraits of himself standing beside his muffins. In 1829, the police got organized and started making things hard for street traders, eventually banning the Muffin Man’s bell. Why? We have no idea. And that, apparently, was the beginning of the end of the Muffin Man. It was all in the bell, I guess. Second proving, then the muffins need to be baked on a griddle or hotplate. Ali has no idea what a hotplate is. Sigh. Thirty minutes to go, they start trying to heat up their hotplates and bake their muffins. The temperature of the hotplate is tricky, because if it’s too high, the outside will burn and the insides won’t bake enough, but too low and the whole thing will dry out. Kimberley had the presence of mind to put a scrap of dough on the hotplate to help her judge when her muffins would be done. Howard’s worried that he’s not getting an even bake. Sue puts her elbow in one of his unbaked muffins, flattening it entirely. Oh, come on, Sue! For God’s sake, DO NOT lean on any part of the work surface! You know these people have stuff under every tea towel! This poor man! He takes it fairly gracefully, which is probably more than I would have done. Glenn’s are definitely too dark. Nobody’s really sure how you tell if they’re done or not. Guess. There really is no other way. It’s a few minutes per side, typically, flipping often so they don’t brown too much. Time’s up. The muffins are put anonymously on the front table. Paul notes that Lucy’s are raw in the middle and too small. Mark’s are a bit irregular. Beca’s are ok, but too thin, and so are Glenn’s. Frances’s are all different sizes and too brown. Ali’s are barely done and too brown on the outside. Rob’s, of course, are perfect. Sue explains what happened with the elbow, but that doesn’t prevent Howard from taking flack for underbaking. Deborah’s are unevenly baked, Ruby’s and Kimberley’s pass muster. Bottom is Lucy, followed by Beca, Howard, Ali, Deborah, Glenn, and Mark. Rob, Ruby, Frances, and Kimberley get top marks. Man, unless Lucy does an amazing showstopper bake, I think she’s out this week. Paul thinks Kim and Ruby are having a really good week, which is quite the turnaround for Ruby. I’m glad to see she managed to pull herself together. Mary admits that Lucy’s having a rough weekend. I’ll say. Showstopper: create a decoratively shaped loaf. Well, that’s vague. Everyone starts baking. This is a tough one, because dough tends to change its shape as it relaxes and proves, so trying anything too elaborate is tricky. Ruby’s doing a sweet bread, white chocolate and orange in a peacock shape. Wow, that’s ambitious. She’s mixing it all by hand, which throws Paul, but hand is how she does it all the time, and I say you do what you’re comfortable with. Also, mixing bread by hand is not at all hard. I do it all the time, mostly because I don’t feel like mucking up my mixer and having yet more dishes to do. Kim’s doing a ‘peace bread’ made of lots of buns put together for easy tearing and sharing. It’s going to be flavoured with za’atar spice mix and garlic. Yum. Garlic is roasted, herbs are picked, raisins are measured. It’s not enough, of course, just to make a plain loaf, we need some crazy flavours. Howard’s doing orange zest and oregano, which sounds like a great combination, though Paul isn’t sure. Lucy is doing roasted tomato and garlic bread with her own sourdough starter. But she’s just doing a round loaf. Did she learn nothing from the breadstick fiasco? Stop thinking so simply! Mary gently reminds her that she has four hours, so maybe she could have done just a little bit more in the way of shaping? Lucy’s like, yeah, I guess, but I think this is glamorous. A round loaf? Wow, she has simple notions of glamour. Dough is put aside to prove while Rob pulls out a huge array of tools he’ll be using to shape and carve his loaf, which is a tribute to that octopus that was allegedly predicting all the winners of the World Cup in Spain a few years ago. Bakewells start shaping their proved dough. Lucy tells Sue about her idea to do a tomato bread in the shape of a tomato (meaning: just round) and Sue clearly thinks she’s an idiot. Unless someone else massively screws up here, she’s so going home. Ali’s doing an insane yin yang bread that has white chocolate and apricots on one side and chicken tikka and paneer on the other. Ok, I get the idea of having a savoury side and a sweet side, that’s cool, but at least do flavours that meld together. White chocolate and chicken tikka sounds absolutely disgusting. Granted, I loathe white chocolate with an extreme passion, but even regular chocolate…yegh. Mary asks where he got his inspiration for this and he says it was in a dream. Well, that explains a lot. She hopes it works out for him. A few of the bakers are just doing plaits, which reminds me of the insanity of the plaited loaf from last year. Remember how one woman said she’d never plaited anything in her life? Even though she had, like, three daughters? That seemed kinda crazy. Beca’s making a Christmas wreath bread. Rob’s tentacles are too long to go in the proofing drawer. One hour left. Last-minute details are completed before loaves are popped in the oven. Mark’s worried that his plaited loaf decorated with wee ears of corn isn’t enough. Oh, Mark, don’t worry. It can’t be any more boring than Lucy’s loaf. Glenn puts his loaf in the oven and urges it to spring. Hee! Sue declares the octopus the sexiest psychedelic cephalopod she’s ever seen. Glenn laughs at himself for being one of those people sitting in front of the oven, obsessively staring at his bread. Heh. If it makes you feel better, Glenn,you’re not the only one. Ali’s bread is coming out all one colour, so he can’t really remember which side is savoury and which is sweet. Breads come out. A couple of them appear to be adhering to the baking sheet, including Beca’s wreath. Rob asks if she wants a hand and she tells him she’s fine. Some of these look really amazing. Lucy declares hers perfect, but when Paul comes around and taps the loaf, he gives her a look that says, ‘really? REALLY?’ and she freaks out and throws it back in for a few minutes. The wreath finally comes off the tray. The peacock’s looking a bit Mardi Gras, but still pretty cool. The octopus is a bit insane. The tomato loaf is boring as hell. Kimberley is worried her bread might be a bit overbaked. Paul likes the look of it and says the crumb is fantastic. Mary says it’s very aromatic and Paul declares it absolutely delicious. Score, Kim! Beca’s spiced sultana and honey Christmas wreath sounds really amazing and looks lovely, if a bit overbaked on one side. She hopes they forgive her muffin mayhem from the previous day. They note that the bread’s a bit raw and needed to be plaited a bit more tightly, though the flavour’s nice. 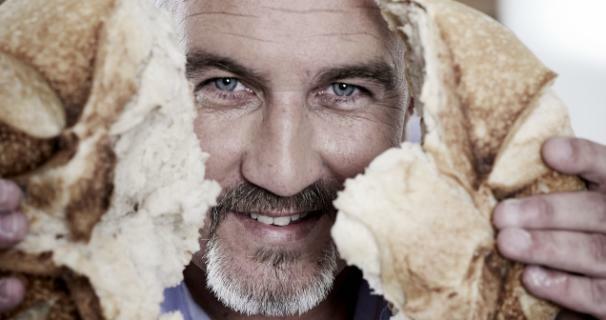 Howard’s bread is in the shape of a sun, and the oregano and orange combo wins Paul over, as does the perfect bake. Time for Ali’s yin yang bread. It looks really pretty and is said to be quite clever, so I guess the flavours were ok after all. Deborah’s done a walnut loaf in a flower shape. It’s a bit underbaked. Glenn’s done a harvest crown with little mice, which is cute. He did a great job. Christine did a double-plaited loaf that looks great and has a wonderful bacon-y taste, according to Mary. Frances did a beautiful sailors’ knot using two different types of dough that impresses Paul. It takes a minute for everyone to identify all the bits of Rob’s octopus, and the interior is a bit dense and the flavour’s not hugely interesting. He went for style over substance this time. Mark offers up a sage and garlic plait and worries that it’s not good enough. Those ears of corn do look a bit more like snails than corn, I have to admit. Mary agrees with me. Paul thinks it needs more colour. Also, the sage isn’t prominent enough. Lucy’s hugely boring loaf is next. Paul tells her this isn’t creative enough. It’s also a very dense structure, which indicates it was underproved. It has a good tomato flavor, though, so there’s that. Ruby presents her peacock and admits she’s not entirely sure the bake was ok. Mary says it tastes delicious and Paul calls it very clever. Well done, Ruby! Sue begs her not to take it away, but she does. Time for the powwow. Mary expresses disappointment in Lucy, and Rob’s and Mark’s loaves don’t impress either. They loved Ruby’s and Kim’s, though. Judgment time. Star baker is Ruby! Woo hoo! From the bottom to the top, well done! I’ve decided to go ahead and like her, she seems really sweet, and she’s clearly talented. Second to be kicked off is Lucy. No surprise there, she basically screwed up every challenge. Sue and Mel hug her, followed by Paul and Mary. Lucy tells the cameras she’s disappointed, but she had fun. Mark’s relieved, though I didn’t really feel like he was in that much danger. Beca promises to be back to her butt0kicking self next week. And speaking of next week: petit-fours, floating islands, and trifle. Mmmm, trifle.